(AP)—Ten endangered Borneo pygmy elephants have been found dead in a Malaysian forest under mysterious circumstances, and wildlife officials said Tuesday that they probably were poisoned. 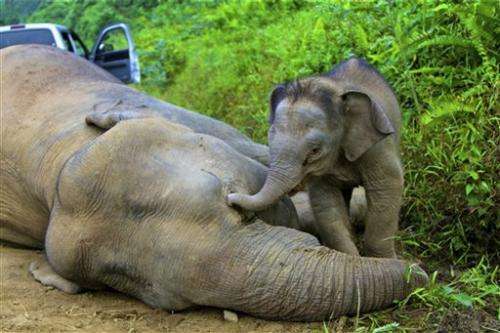 Carcasses of the baby-faced elephants were found near each other over the past three weeks at the Gunung Rara Forest Reserve, said Laurentius Ambu, director of the wildlife department in Malaysia's Sabah state on Borneo island. In one case, officers rescued a 3-month-old calf that was apparently trying to wake its dead mother. Poisoning appeared to be the likely cause, but officials have not determined whether it was intentional, said Sabah environmental minister Masidi Manjun. Though some elephants have been killed for their tusks on Sabah in past years, there was no sign that these animals had been poached. 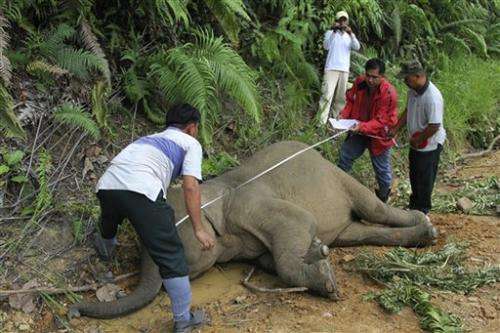 "This is a very sad day for conservation and Sabah. The death of these majestic and severely endangered Bornean elephants is a great loss to the state," Masidi said in a statement. "If indeed these poor elephants were maliciously poisoned, I would personally make sure that the culprits would be brought to justice and pay for their crime." The WWF wildlife group estimates that fewer than 1,500 Borneo pygmy elephants exist. They live mainly in Sabah and grow to about eight feet (245 centimeters) tall, a foot or two shorter than mainland Asian elephants. Known for their babyish faces, large ears and long tails, pygmy elephants were found to be a distinct subspecies only in 2003, after DNA testing. Their numbers have stabilized in recent years amid conservation efforts to protect their jungle habitats from being torn down for plantations and development projects. The elephants found dead this month were believed to be from the same family group and ranged in age from 4 to 20 years, said Sen Nathan, the wildlife department's senior veterinarian. Seven were female and three were male, he said. Post-mortems showed they suffered severe hemorrhages and ulcers in their gastrointestinal tracts. None had gunshot injuries. "We highly suspect that it might be some form of acute poisoning from something that they had eaten, but we are still waiting for the laboratory results," Nathan said. Well, as my Libertarian Brothers say.. The only good animal is a dead animal. If he won't do it for himself then the coming National Razor will do it for him. Have your freedom lists ready people. Moa birds were eradicated with Aboriginals in Australia before five hundred years. Was the capitalism culprit there too? Were their feathers or meat traded? Capitalism isn't the only form of murder of course, and ValeriaT is foolish to presume it is. Moa birds were native to New Zealand, and were eliminated by Maori tribesmen.